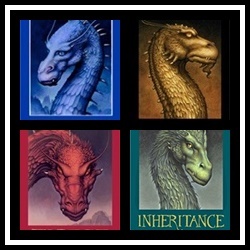 The Inheritance series, also called the Inheritance Cycle, is a young adult fantasy series by Christopher Paolini. 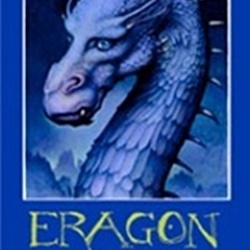 The series chronicles the adventures of Eragon, a young farm boy who finds a dragon egg in the woods near his home and becomes part of a legend as old as the Empire. When the egg hatches, Eragon learns his true destiny to become a dragon rider, and that he and Saphira- his dragon- must fight to save the Empire from the evil rule of King Galbatorix. The Inheritance cycle was originally intended to be a trilogy. 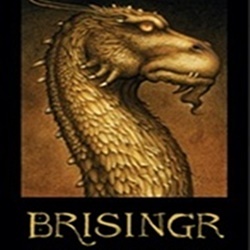 However, before releasing the third volume in the series, Brisingr, Paolini decided that there was too much left of the story to put it all into one book. So he announced that there would be a fourth volume written, and that he already knew how the story would end. Unfortunately for fans, that was over two years ago and details for the final installment have yet to be released. 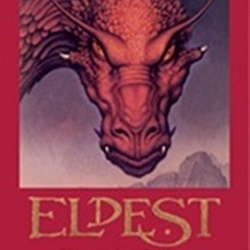 Below you'll find a complete list of the Inheritance cycle novels in chronological order. Click on the title for more information. It took Aaron a while to convince me to read Eragon. I was into more urban fantasy and I didn't really think I would like it, but boy was I wrong. I a little disappointed that I didn't listen to him and read it sooner. I've listened to the audio version and it is fantastic! Eragon is full of great adventure and epic battles the likes of which will have you strumming with aticipation for what is to come. The plot is great, the characters are interesting and easy to relate to and there is great build-up to the battle in the end. I looked forward to every moment of the story and I think a wide variety of other readers will feel the same. It's hard not to read or listen to this book and not be invested in several of the characters, both primary and secondary. It did take me a little bit to get into the story, once Eragon left home and started learning how to fight and use magic, the excitement really picked up. After fighting to save the dwarf city- Tronjheim- from being overtaken by Urgals under the control of Kind Galbatorix, Eragon and Saphira set out on the journey of a lifetime in Eldest. They travel to new places, meet tons of new people, and face nastier, deadlier enemies than they did in the first volume. What I love about the Eldest book is that the action just doesn't stop. From the first few pages it picks up right where the Eragon book left off and continues to build until the very end. Also in Eldest, Roran plays a larger part in the story. We get to experience his leadership of the resistance in Carvahall right along with Eragon and Saphira's adventures. Not to mention the various other characters we get more insight into as the story evolves. As I said with the first, I am so disappointed it took me this long to finally read the Eragon books. They just keep getting better. If you like adventure and epic battles, great characters and a touch of humor and forbidden love, this is a very exciting read. There is tons of action in Brisingr, both with and without Saphira present as Eragon is forced to leave her behind while he travels to the dwarf city to help them decide on a new king. As with the Eldest book, the action just doesn't stop. There's always something going on and a fight to be had, but also Eragon is finally taking charge of his destiny and growing into the legendary Dragon Rider he is meant to be. He begins this chapter of his journey by helping his cousin rescue his beloved Katrina, and during the process makes a difficult decision that shows how much he's grown over the course of the series. He shows that while he is honest and merciful when the situations calls for it, he is also a ruthless opponent and an enemy more powerful than anyone ever imagined... even Eragon himself. The battles are greater than those in previous books, the enemies stronger and much, much more cunning, and each victory is leaps and bounds more satisfying than the last. There are so many questions left going into the fourth book and I can't wait to find out how things are going to end up. All I can really say for sure is that it should be beyond epic! A colossal battle between the forces of good and evil, a new Dragon Rider we have yet to be introduced to... and the list goes on. This is a fantastic read, so read it! But don't jump the gun. It must be read in order for you to understand the story so read the Eragon book first.